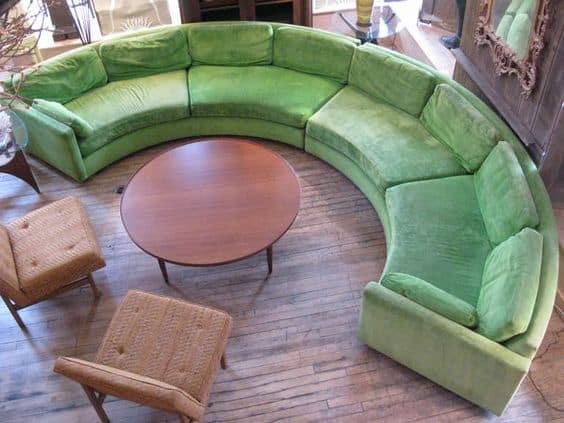 With these 20 curved sectional couches you’ll have the space to entertain, relax with the family and utilize every bit of your living room. Check out our favorite finds and see if one strikes your fancy. From modern to traditional, there’s something for every kind of home. First on our list includes a super modern piece full of fashion-forward energy and futuristic appeal. 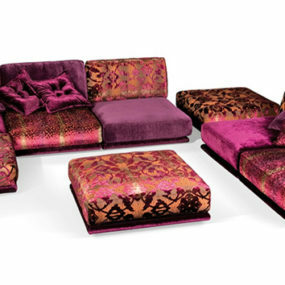 Perfect for large bachelor pads or open spaces with a innovative touch, it’s quite the beauty and perfect for entertaining. 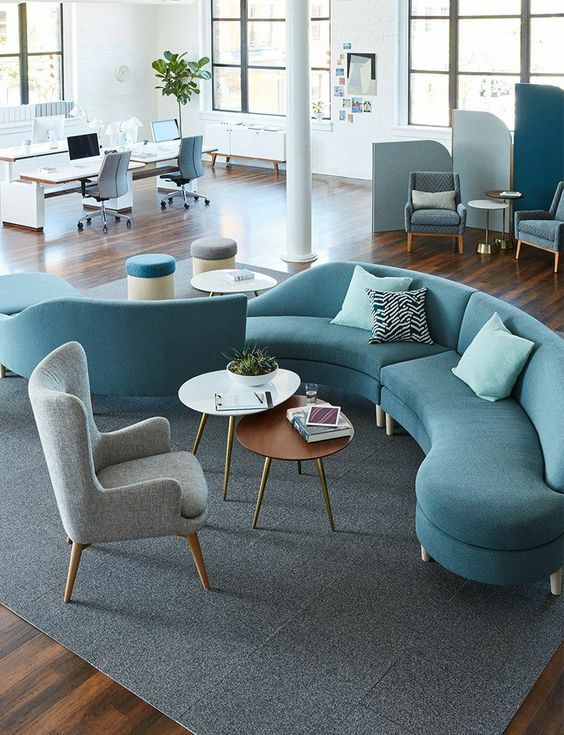 Scandis has a beautiful powder blue curved sectional that we’re swooning for. 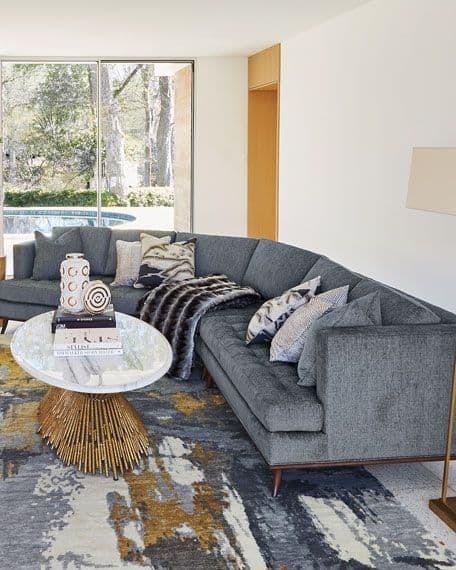 Whether you want to mix up a modern space or recreate a midcentury bled, this couch can become a beautiful focal point for any kind of vision. Then we found this gem from West Elm. It can fit in smaller nooks and provides a beautiful, clean palette to work with. This blue is easily paired with richer or pastel shades. And the design fits into midcentury modern styles or even something a bit more upscale. Home Decorators gave us this beautiful skin-toned design as well. 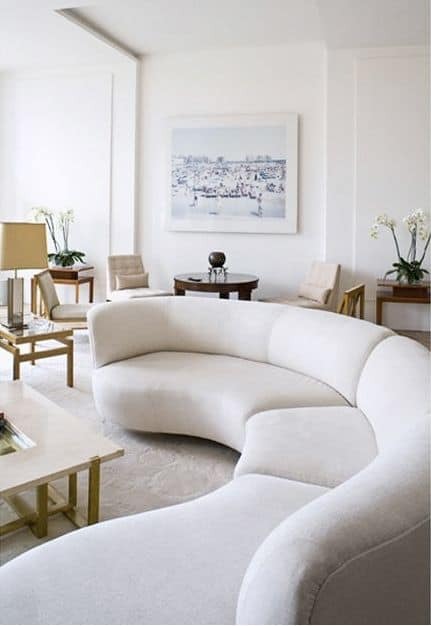 Slightly curved and can be used as two loveseats or one sofa, it’s a great choice for more formal sitting rooms. Also, accenting it with a bit of rose gold or yellow gold is quite the nice decision. 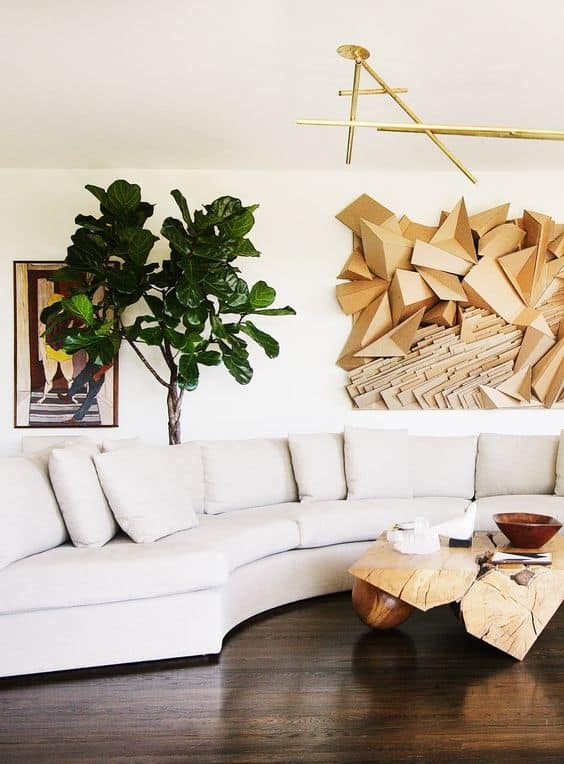 Check out this chic, neutral design. 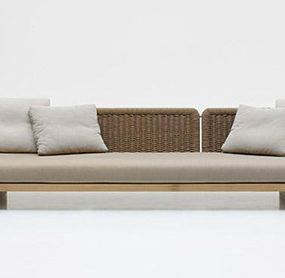 It’s perfect for larger, more open spaces and again, it’s a versatile piece that can be used inside a variety of homes. 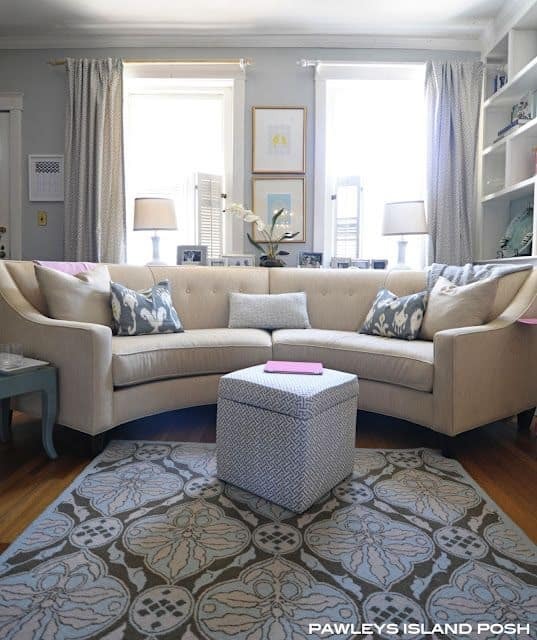 From family-friendly to more posh, it can blend right in with the proper accents. 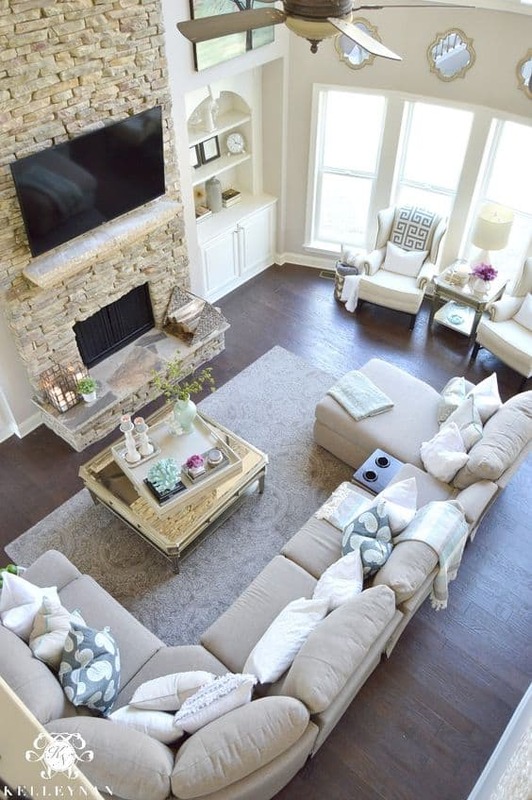 Kelleynan showcased this great living room setup that families everywhere could and would enjoy. 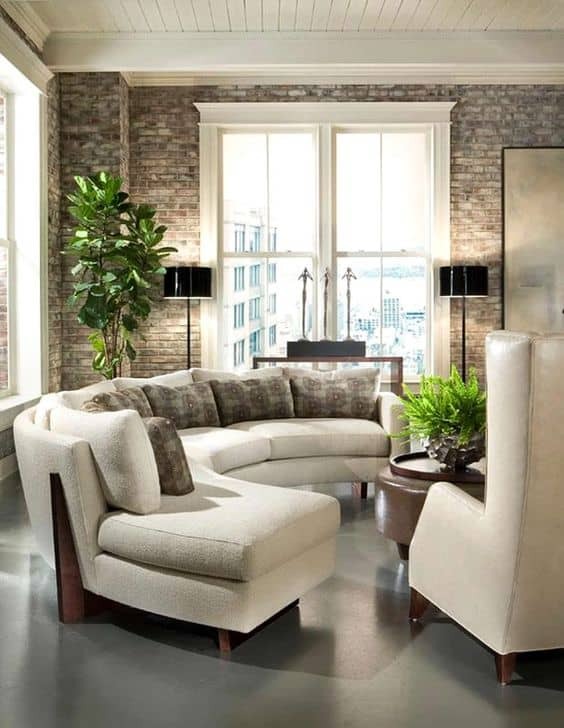 There’s ample amounts of seating and the light neutrals create even more of an illusion of space while playing well with the natural lighting. 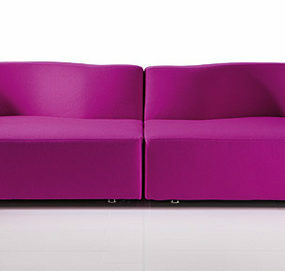 Beautifully feminine with curves in all the right spots, this couch will add a lot of pretty to any room of the house. Whether it’s a formal living room or an open home office, it’ll fill the corners nicely. Apartment Therapy is where we found this sharper, studded design. 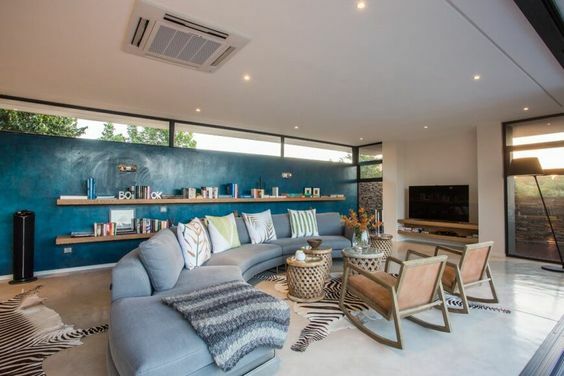 It’s got an easy, contemporary vibe but also fits nicely in more traditionally-oriented home. But it’s not boring, which is the perfect choice for family homes with personality. My Domaine has a lot of beautiful inspiration too. 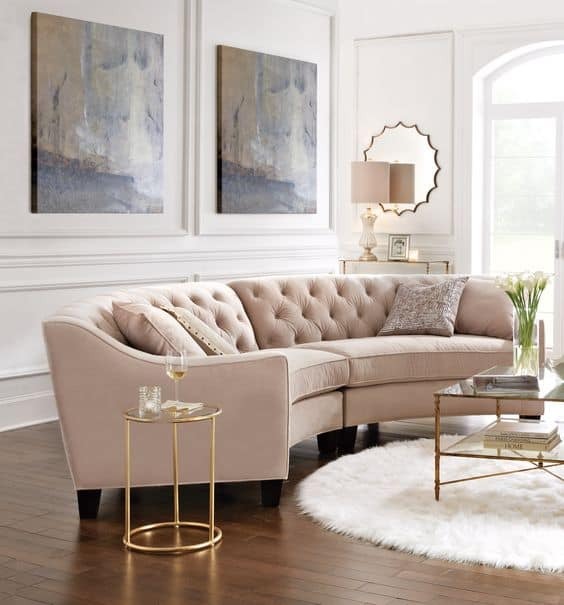 And that includes this clean, cream curved sectional sofa that can fill a room with ease and compliments deep hardwood floors quite nicely as well. But, My Domaine had this one up their sleeve as well. Gold on the bottom and a seamless taupe on top, it’s versatile within color palettes and boldly feminine within style. Top off your formal living room or posh home office with this one. Who loves charcoal? Horchow is where we found this soft charcoal design filled with modern spirit. 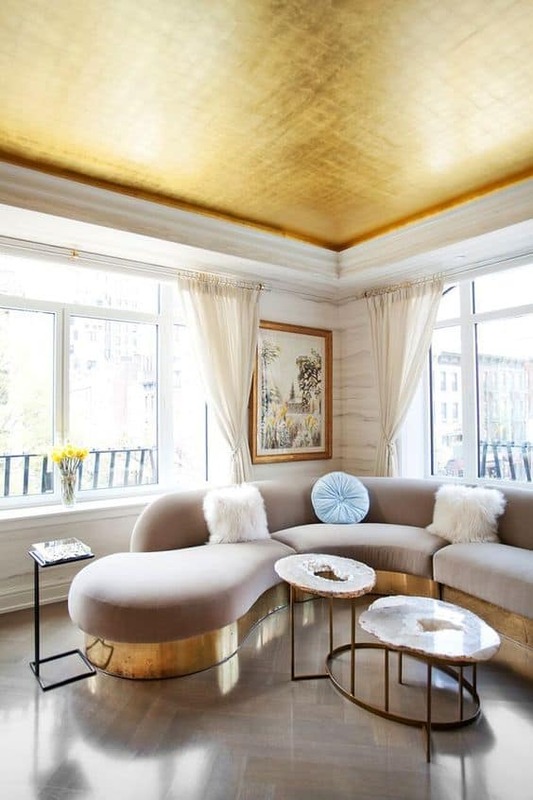 We see it paired here nicely with metallic neutrals but know that it can be complimented easily by soft pastels or jewel tones. 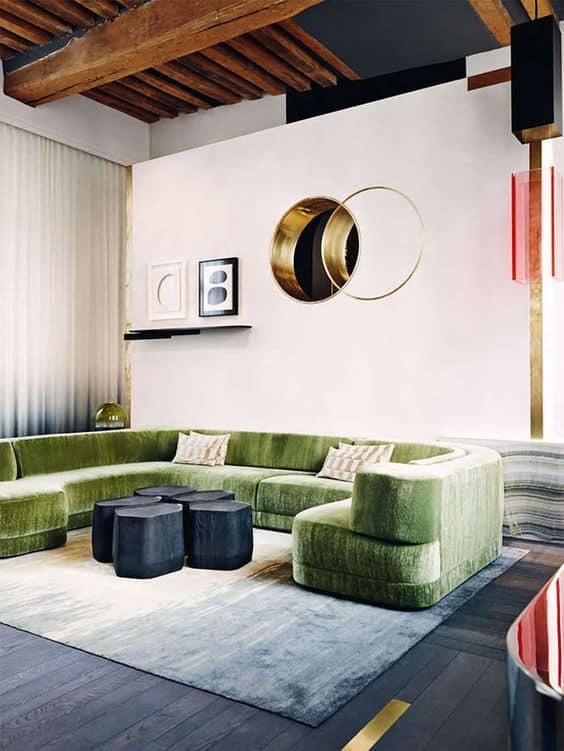 And then there’s this outstanding green piece, made for a home that loves a bit of bold flavor. 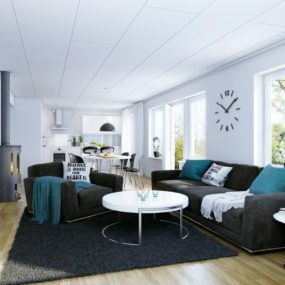 Again, it provides a lot of seating opportunities for large families or those that love to entertain and have a lot of space to fill. Here’s another cream design to grab some inspiration from. It’s legs and deep hardwood accents create a more modern style but overall it works well inside more traditionally decorated home. 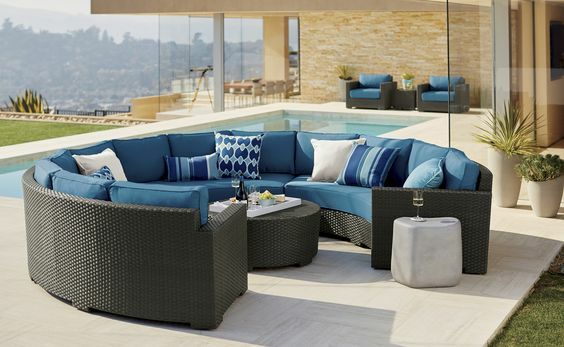 Crate and Barrel provided us with something a bit more outside-the-box of sectional sofas. These piece is for outside! 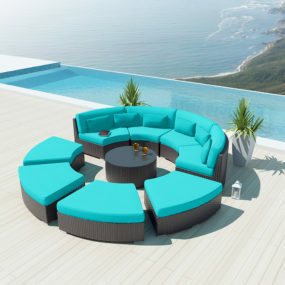 Those with large backyards or entertaining spaces outdoors should take a second look at this innovative design. 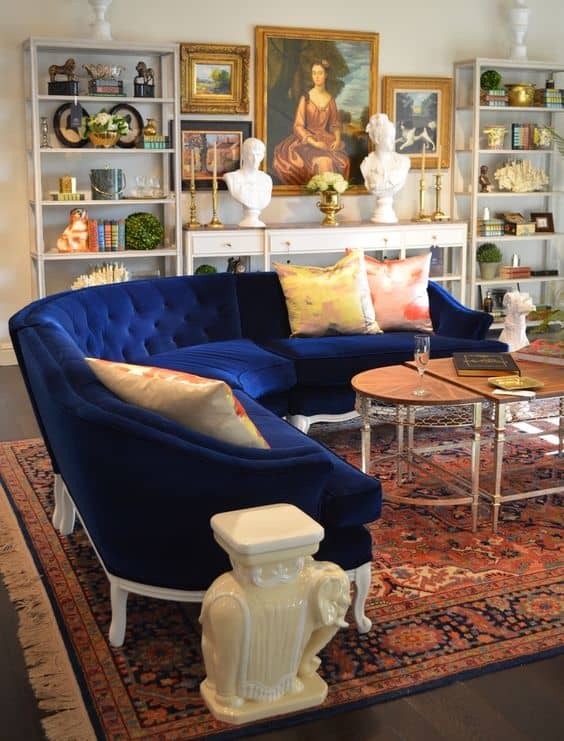 There’s definitely a soft spot in place for blue velvet in the interior design world. 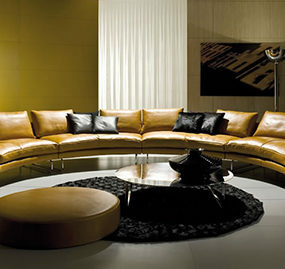 And thanks to Impressive Interior Design we have this royal sofa to swoon over. With a Victorian, antique edge it’s a great piece to provide seating and table talk. Home Stratosphere had a blue beauty up their sleeve as well. A bit of a gray-blue blend, it’s a great piece to work around and build off of. It also fits this elongated room perfectly while not stunting any seating opportunities. And now we have another green piece that those with a bolder taste will love. Add a pop of color and provide cozy spots to enjoy the room with this design. 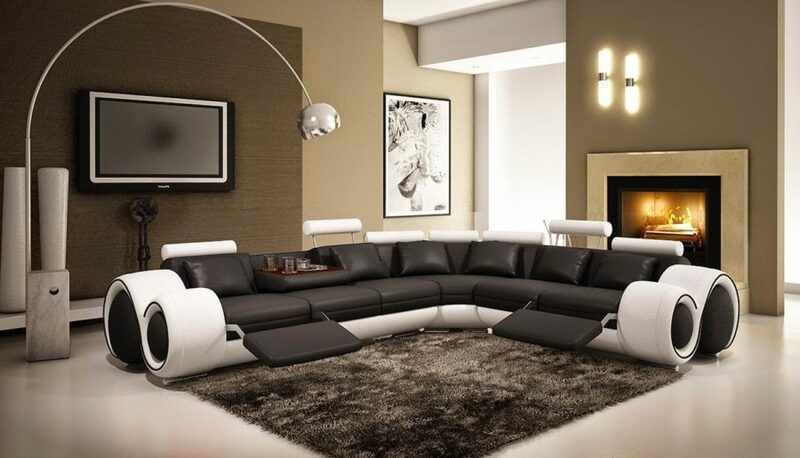 Compliment and contrast with a palette of neutrals and make this the best decision of the house. 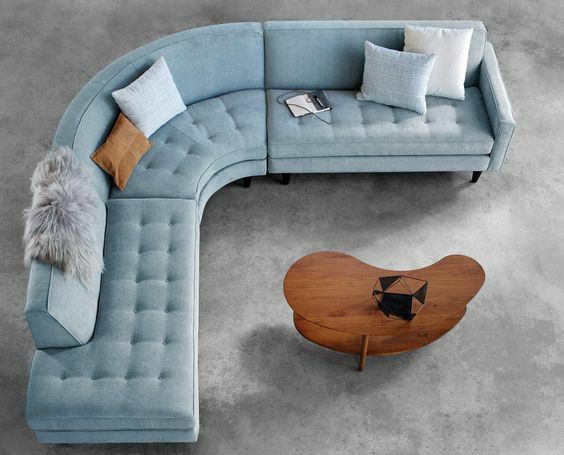 This curved sectional sofa is a bit smaller but just as versatile. 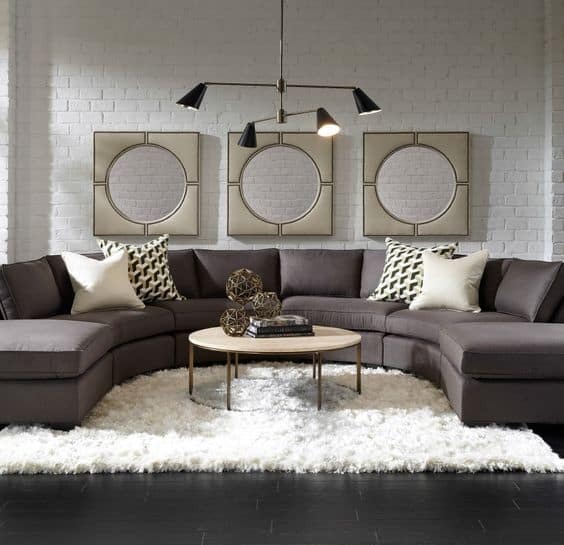 Separate them to create two loveseat options or a cozier seating arrangement in a smaller living rom or home office – the possibilities are endless! 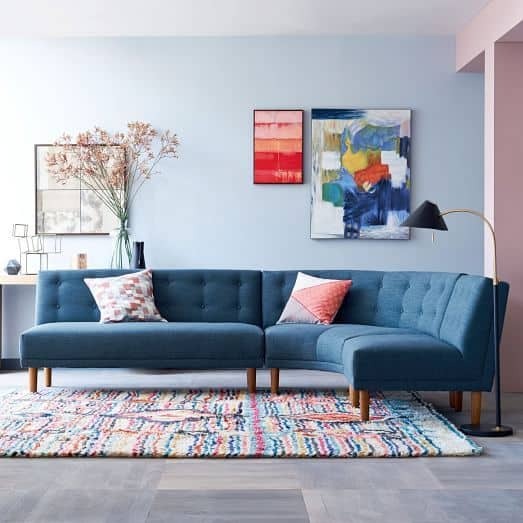 Spaces + Places leaves us off with a curved, teal velvet sofa that will really create a moment among your contemporary décor. 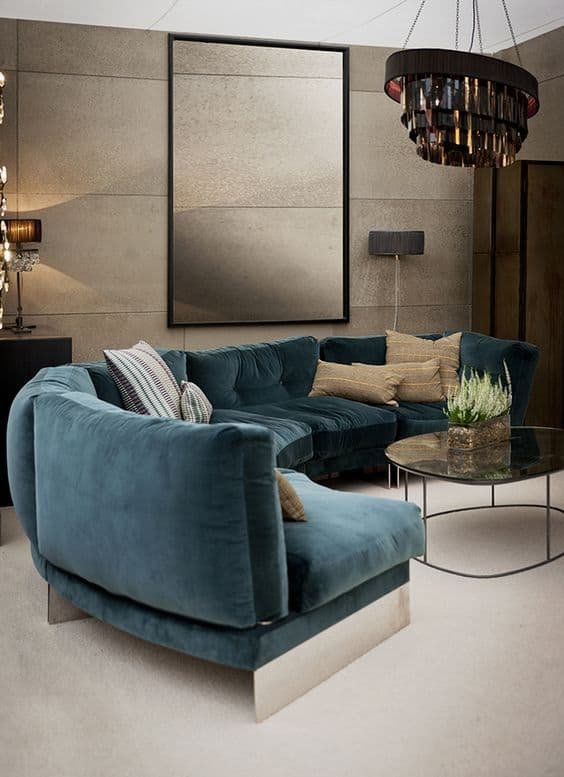 The mirrored legs and that beautiful, rich texture, it’s a winner inside any home.